From the Editor: In the 1980s Joe Cutter pioneered the concept of teaching cane travel to blind toddlers and preschoolers. He gave the following presentation to parents of blind children at the 1994 National Federation of the Blind Convention. When Barbara Cheadle asked me if I would be interested in speaking about parents as the blind child's first mobility teachers, I responded with an enthusiastic Yes! I was delighted, because I believe this statement to be true, and I welcomed the opportunity to relate to you my ideas on this subject. I have come to respect and value the information and positive thinking about blindness that I have gained from the National Federation of the Blind. Blind persons—including blind children and their parents—have taught me the most about blindness. In a small way, then, your sharing with me through the years comes full circle as I now share my thoughts with you. My thoughts and words today are from a book I am writing about blind children and independent mobility. Interwoven in this book is the common theme that parents truly are the blind child's first mobility teachers. It begins when the expectant mother introduces her baby to movement in utero. Whenever the mother sits, stands, turns, or walks, the child inside her experiences movement. Once the baby is born, the mother and father become attached to their child through touch—through holding, carrying, and playing with their baby. The joyous world of movement has begun, and it is the parents who are the first, the primary, educators of their child. It is only natural, therefore, for parents of blind children to be their child's first mobility instructors. After all, they are the ones who set the stage for the play of movement. If parents are the natural educators of their child, then the professionals are secondary educators of the child. In the early life of a blind baby parents may be introduced to professionals, programs, and services established to assist in caring for their baby's needs. Parents may have a blindness professional visit their home, or they may take their baby to an early intervention program outside the home. Some of these services are given directly to the baby. In others the professionals provide guidance to parents with suggested activities, materials, and strategies that will facilitate the child's learning. The intent of these programs is to inform parents and at times give hands-on intervention with the child. Now, I have visited many of these early intervention programs over the years and have learned much from observing the creative teaching of many talented, dedicated, and hardworking professionals. I have also visited in the homes of many families of blind babies. I have learned equally as much through observing the creative teaching of talented, dedicated, and hardworking parents. The significant difference is that parents are not paid, and they do what they do for twenty-four hours a day. I note this difference to punctuate my observations that parents have a much longer, more sustained, and intimate relationship with their child than do the professionals. Yet, when blind babies and children enter early intervention programs, parents are often presented with an attitude that implies, "We know what is best for your child." This attitude challenges the natural teaching role of parents. When educators, whether intentionally or not, separate parents from the program of service, in whole or in part, then a message is sent to the parents that someone else—the blindness professional—did for their babies what they—the parents—could not or did not do. This may affect the kind of relationship that parents have with their children. Parents may develop feelings of inadequacy. They may take less initiative or be hesitant about movement activities with their babies and children if they have come to believe that the professional's role is more important. Speaking of professionals, I can't help saying something that has disturbed me for a long time. Why do we call teachers who work with blind children vision teachers? It sounds like a contradiction in terms to me. Imagine getting a knock on your door, and when you open the door the person says, "Hello, I'm the vision teacher. I'm here to work with your blind child." I use the term blindness professional because it seems more relevant to me. Programs of services to blind children do what they do best when they promote attunement between children and parents. The parent/child relationship is indivisible, and that is how it should be treated and respected by the professionals. Blindness professionals and other educators who appreciate this parent/child relationship will rely upon the parents as a vital natural resource. They will support parents in their efforts to establish mutually pleasing and nurturing relationships with their babies, and they will help them with accurate information about blindness. For example, when I was studying about babies I was fascinated by something that, in some of the research, is called a voice/space event. When even very young babies hear the sound of their mommy's voice they turn toward it in expectation of seeing mommy's face. I discovered the first time I worked with a blind baby that this baby's head and eyes, although he could not see, moved in the direction of the sound of his mother's voice. This baby, too, was looking for the voice/space event. The obvious alternative technique at this point would be to assist the baby's arm and hand to the mother's face, linking sound with touch. This common human trait of the voice/space event, which in the sighted baby links sounds to vision, has been adapted for the blind baby by linking sound to touch. The usefulness of this adaptation depends largely upon how I, the professional, present it to the mother. First of all, I cannot be a substitute for the mother (or the primary caretaker) in this situation. The voice/space event must take place with the mother, not me. Second, if I present this to the mother correctly, she will come to understand that she, too, could have made this discovery. She will then go on and use this knowledge and the confidence she has gained from it to make her own observations, adaptations, and compensations with her baby without my assistance. This is how it should be. Professionals should not supplant the parents as the child's primary educators; they should encourage it and nurture it. This includes the role the parents should play as their child's first mobility teachers. Mobility for children begins with play between parent and child. In the early years parents engage in a variety of play activities with their children. The importance of play cannot be overemphasized. Play is FUNdamental to being human. Fun and play are the child's form of work, of getting the job done, of acting on the world, and reaping the rewards from it. The head of the Department of Infant Studies at Rutgers University, Dr. Lorraine McCune, writes, "When play is defined to include all of the baby's freely chosen encounters with objects, a large portion of the child's waking time is playtime." The implications of this statement for blind children are many. When blind children are restricted in the kind and amount of play they may perform, and when adults limit their free intentional movement, the context of their understanding of people, places, and things will also be limited. This will necessarily cut short their ability to reason, experiment, and create. Blind children are vulnerable to having play done to them, initiated for them, and taught to them in formal activities. Adults would be serving the blind child's best interest if they would instead put their energy into setting up the environment so that the blind child could initiate his or her own play more often. Such spontaneity is fundamental to being human, but blind children are often in jeopardy of having spontaneous experiences restricted by well-meaning adults. These principles are crucial for parents and professionals to understand as they consider their role in promoting movement and mobility in the blind child. When children are young they are learning to identify and label the world. Blind children are no different. They need to become familiar with the world, too. Familiarization develops orientation. For sighted children, vision puts them in the action. For blind children touch, sound, and movement puts them in the action, too. You cannot label the world for a blind child by touching it for him. To be meaningful the experience must come from the child's own action. Use of the cane facilitates self-initiated action and thus contributes to the creation of an active learner. The skilled use of tools is a fundamentally human activity. For children, toys are tools! (Remember, we said that play is a child's work. Toys, therefore, are a child's tools.) They are skill-enhancing instruments. The handheld tool (or toy) is an extension of the body in space for all children. During play the child is introduced to objects in the world. To the child all of these objects are potential toys. Some of these objects will serve an everyday function, such as the handheld spoon, for example. A spoon is more than something you use when you eat. It is a tool of action. When we think about the spoon in this way, we can begin to understand its connection to the blind child's white cane. The cane, too, is a handheld tool of action to get a job done. The better the skill in using these tools—spoon or cane—the better the job will be done. Since we know that hand manipulation of tools develops over time from "on body" to "off body" for all children, we can then infer that the spoon is a precursor to the cane. Both tools manage space near and far respectively, the spoon being closer to the body and the cane being farther off the body. Whether banging on a plate with a spoon, or banging on the ground with a cane, the blind child demonstrates the use of movement in space. As the child's first mobility teachers you will want to know what the cane can do. The cane is a tool that performs many functions. It can inform, inspect, explore, detect, and protect. Most of all it facilitates getting to know and moving within the world. To illustrate, the cane is more than a windshield wiper on the world. It is the steering wheel that can be manipulated to take you in the direction you want to go. It's the headlight that gives preview of what's ahead. It's the bumper that protects from unexpected encounters. And it is the antenna that is constantly receiving sounds and resonance information from the surroundings. The cane is also the tires that adjust to the terrain and provide a smoother, more stable ride. Finally the cane is the side view mirror that gives peripheral protection whenever the traveler needs to circumvent an object. Like the car, the cane is as effective as the driver using it. Both driver and cane user require training and must obey the laws of the road. Mostly the cane—like the car—gets you where you want to go. This lighthearted analogy is a fun way to punctuate the varied uses of the cane. Thinking of fun, what child is not fascinated by a stick? It connects the child to the ground in a way that is fun. When walking, it seems natural to hold a stick and touch the world. Therefore, it is the most natural act for the blind child to be using a cane. Fun, play, toys, tools, self-initiated movement, canes—are you beginning to see the connections? As your child's first mobility teachers the decision to use a cane must be made by you, the parents. You may come to such a decision in conjunction with the orientation and mobility specialist, or without such a professional. The point is, it should be your decision. Generally a cane will help facilitate a blind child's movement shortly after he or she begins walking. I have known blind children, however, who took their first steps across a large space with a cane. In these cases the child was ready to walk but would not self-initiate many steps across large spaces. Therefore, observe the blind child's movement around the event of walking. If the cane seems to promote movement, go with it. Do posture, gait, and self-assurance seem true with the cane? If yes, then it's facilitating movement. If the child is evaluated by an orientation and mobility professional and it is decided that he or she is not ready for a cane, then ask yourself these questions: What is my child ready for—someone's arm? A pre-cane device that may be more complex to handle than the simple design of a cane? The less safe and efficient movement promoted by the so-called pre-cane techniques? I believe the answers to these questions will lead most parents to the decision to take charge, purchase a cane, and get started. It may be a bit scary, and you may be a bit doubtful in the beginning, but have faith in your own intuition and in your child—you're a team. If the orientation and mobility specialist is on the same radio station as both of you, all the better. If not, you and your child can dance to the music. When others see what's going on, they may decide to join the dance. It is not only okay to take the lead in starting your child with cane mobility, but it may be necessary if the alternative of inaction will negatively affect your child's self-esteem and skill development. You cannot count on the professionals always to have the right answers. Please believe me. I'm a professional, and when I think of some of the decisions I've made as a professional—based upon erroneous assumptions—I want to bury my head in the sand. I remember my personal journey in working with blind children. When I began teaching children I used the same post-World War II techniques all mobility teachers are taught, including sighted guide, pre-cane safety techniques, and certain readiness skills. It wasn't until I happened to take some courses in infant studies at Rutgers University and I was introduced to NFB literature by parents such as Carol Castellano that my assumptions and beliefs about children and cane travel were challenged. That was really scary and threatening to me, but it was also liberating. I will always remember Fred Schroeder's article "A Step Toward Equality: Cane Travel Training for the Young Blind Child." I shall never forget his analogy about crayons and canes. He said that keeping a cane away from a young blind child because the child wasn't ready to use it as an adult was like taking crayons away from a sighted child because the child couldn't write like an adult yet. Like the sighted child using crayons, the blind child initially will use the cane with more exaggerated movements. This is for many reasons: postural security, balance, the newness of the tool, and the human urge to experiment. Through familiarity and maturation the cane will gradually be used with more purposeful movements and, therefore, more efficiency. Please know that the act of playing with the cane is a natural way for young children to experiment. It is how they learn about the cane and how it will work for them. This playing is not a reason to discontinue the cane for fear of a lack of "readiness." Remember, we said that play is the child's work. Therefore, do not be discouraged if the child's initial use of the cane appears to be just playing around. Some of the best travelers started out having fun with their canes. Accordingly, do not insist upon the blind child's demonstrating mature cane skills very early. Such skills as proper adult grip, position, extension, arc, touch technique, and so forth will come in time with maturation. You will risk frustrating the child, and a negative attitude may develop toward the cane if you expect too much in the way of adult cane techniques. Expect the child to use the cane from the source of control best available to him or her—hand, wrist, arm, shoulder—given the strength and control he or she has from those sources. With growth and maturation these components of movement will expand and so will the cane techniques that work off these components. The blind child will want to check out what is being contacted by the cane. You might notice the hand sliding down the shaft to touch the connected object, or the foot moving to check it out. This behavior is also displayed by adults who use the cane for the first time. A basic principle operating with young children is "connection before coordination." This should be accepted as a normal stage in their learning. Do not scold the child or try to prevent the behavior. This behavior will decrease as children learn more about the world around them, and as they become more goal-oriented in their travel. Activities that are fun and enjoyable to the child also tend to facilitate sensory integration and skill development. The cane is a natural tool for these activities. For example, children enjoy banging the cane. They like hearing the echoes they can make with it. They will hold the cane in different ways, even upside down. What they are doing is exhausting all the possibilities of what they can do with a cane. This is a fundamentally human characteristic, and we should not limit such exploration as long as it does not hurt the child or another person. Experiences in school set the stage for what will be expected of children in their adult lives. This is true for blind children, too. But, as stated earlier, blind children are more vulnerable to having their independent movement restricted by others. Most classroom teachers and aides do not know what to expect or encourage regarding the movement of young blind children. Some educators learn quickly and are very good at facilitating movement, and others are not so helpful. This should be of no surprise to us. But what is more upsetting is that some professionals in the blindness field have limiting views about blind children and independent movement. In situations such as this the parent will need to inform not only the teacher working with a blind child for the first time, but the blindness professional, too, about their expectations for their child in the use of the cane and independent movement. Parents cannot assume that just because an orientation and mobility specialist is consulting with the school and working with their child that the child's movement needs will be promoted to the fullest extent. Even if you and the orientation and mobility specialist are reading from the same page of the same chapter of the same book, this doesn't mean that what is happening in school is what should be happening. I have often given a mobility lesson to a child in school and then have come back for the next lesson a week later to discover the cane in the same location. I knew from the condition of the cane and the tip that it had not been used since our last lesson. It is in your child's best interest for you to know what's going on. If your child is not moving about under his or her own volition, then he or she is moving about under someone else's. Parents will need to decide what they want for the child and make it clear to the school personnel. It is that important an issue. The blind child is being prepared to believe one way or another about his or her own movement in school and the larger world. Children will either learn that they can take responsibility for their movement or not. It is that simple. Of course, I am primarily thinking about the sighted guide. Now, sighted guide is certainly a sufficient, and sometimes appropriate, method of travel. I'm just concerned about young children's using it as their standard operating procedure for moving around. Also, I think the term implies that the guide must be sighted. One thing I have learned from this convention and other NFB conventions is that the blind certainly do lead the blind, and most efficiently, too. Some professionals now prefer the term "human guide," but I am even uncomfortable with this. It still implies that one person is leading and the other following. There are times when we all prefer to walk with someone, and it is not a matter of guiding or leading. Carol Castellano came up with a term that I like best. She calls it "paired walking." And isn't that what it really is? To the questions of when to use the cane, how much, and where (school, home, playground, etc. ), first ask yourself if the cane promotes and facilitates movement, confidence, curiosity, safety, and getting to know the world. If it does, then use it. I believe, by the way, that the cane should be used both at home and at school. (By home I do not mean inside the house in which you live. I mean all the places your family may normally go with the child—the mall, restaurants, places of worship, homes of friends, etc.) Using the cane in one setting and not the other is a limitation and sends a mixed message to the child. 1. Is your child relaxed while moving independently? 2. Is your child's stress level elevated in unfamiliar or congested areas? 3. Is your child's performance in street crossings and night travel age-appropriate? 4. Are your child's gait and posture negatively affected as a result of pushing vision to the point of inefficiency? 5. Are you holding your child's hand not because you want to, but rather to avoid uncomfortable or difficult-to-manage travel situations? 6. Do you think the cane may facilitate safe, effective, efficient, or confident travel? If the answers to any of these questions are yes, you might want to give the cane a go. If you've answered yes to any of these questions and are still doubtful about trying the cane, you may have hidden negative attitudes about blindness that are getting in your way of making a logical decision about the cane. As your child's first mobility teacher, you owe it to your child to keep an open mind about the cane. One opportunity that you have here at this convention is to observe visually impaired travelers using canes. You might think of this as your NFB Convention School, and this is your 101 course in mobility. After all, you will remember that you are your child's primary mobility teacher. Observe the confidence, poise, relaxed posture, and grace with which they move. Observe their safety and efficiency. One of the things, by the way, that I would like to do at this year's NFB Convention School is to receive a mobility lesson under sleepshades from a blind mobility instructor. So that's an open invitation to anyone here who is blind and teaches mobility. One insight I'd like to pass on to you is something I was told by a parent who learned this by observing blind people with canes at her first NFB convention. I think it sums up many of the thoughts I'm sharing with you about vision and visual inefficiency. This parent told me she had concluded from her experience that you have your vision for what you can see, and you have the cane for what you can't. I can think of no other more truthful or basic statement than this on the issue of using a cane. I think it's important to share a word or two with you about blind children who have developmental delays. All children observe the world through their sensory-motor systems. Vision is not essential to observe the world. The brain is an equal opportunity employer and does not negatively discriminate against the various modes of gathering information and observing the world. The five senses, like fingers of the hand, retrieve information and give meaning to the world and the child's movement. Blindness is a physical characteristic, the absence (partial or total) of sight. I do not think it fundamentally alters how humans think or adapt and compensate. We do not think with our eyes. We think with our brains. So, whether we read Braille or print, or communicate with sound or manual sign language, it is the brain that takes in the sensory information, decodes it, and processes it. The developmental route for blind children who have added factors impacting upon their development—cognitive, physical, emotional delays—is more precarious. These children are especially vulnerable to having others do for them what they can learn to do for themselves. But, like all children, they thrive on a can-do approach. If anything, these children need more of the "learning by doing" method. Remember, the process of independence begins with self-initiated action. It is through his or her own action that the child has the chance to observe the consequences of that action, then refine it and practice it as a new skill. Children who are given the opportunity to initiate their own movements are motivated to do more, learn more. When others do the movement for, or to, them, children lose interest in their own activity and become passive. For example, a blind child who uses a wheelchair would have greater possibilities for independent (self-initiated) movement with a one-wheel drive or motorized wheelchair. With one hand the child could operate the chair, and with the other use a white cane for preview of obstacles ahead. This set-up, which promotes independence, would be superior to the alternative of the child being constantly dependent upon someone else both to push and to guide him. In fact, I saw someone in a wheelchair this morning who was using a cane for preview. If you suspect that your child is delayed in development by factors other than blindness, you will need to secure reliable information and services to provide a sound menu of experiences and activities. To such a menu you can add the alternative techniques of blindness. As your child's first mobility teacher you can creatively adapt and compensate along with your child. You can promote your child's self-initiated movement, and you can expect others to respect the goals that you set for independent movement. In Budapest, Hungary, there is an interesting program called conductive education. It's a program for the physically impaired child with cerebral palsy and other impairments that affect the child's development of independent movement. Some of these children are also blind. The program's philosophy is ortho-functional. The child learns by doing. Self-help skills are essential and valued along with academics. It is more important, for example, for a child to get to class independently and late than to get there on time because of dependency upon someone else. The conductive education approach believes that if a child is perceived as dysfunctional, then the goals set for that child will reflect those perceptions. How we perceive children can make all the difference in the goals we set for them. It is the difference between using a promotion model versus a deficit model. The deficit model stresses limitations. The promotion model emphasizes possibilities. The independence these children are likely to achieve depends a good deal upon our expectations of them. Do we see children with limitations, or children with possibilities? Let me give you an example of what I mean. The following sentences are from the book First Steps, published in 1993 by the Blind Children's Center. These sentences demonstrate the disturbing sighted bias and erroneous assumptions about blindness still to be found in the professional literature. "The world of children with visual impairments is a very different one from ours." My response is, "How so?" Are the authors implying that blind children are fundamentally different from sighted children? I don't believe it, and the evidence doesn't support it. We all live in the same world. "Although these children are faced with a puzzling array of sensation and information, our loving guidance can create a safe and nurturing path for them to follow." My response is that the current research about how children learn, specifically infants, suggests that the world is not perceived as a puzzle. Rather, infants organize their sensory information to make sense out of the world. They improve upon their perceptions, adapting and compensating as they get more information. It would appear that the authors altered the data to fit their preconceived notion about blind children. The sentence implies that what is needed for learning is for blind children to follow the adults' lead instead of the adults following the child's lead. Again, this is inconsistent with my experiences and with the research. The third sentence of the introduction reads: "Parents, family members, educators, and health care professionals find themselves drawn together by the formidable challenges of these children's infant and preschool years." 1. Causing dread, fear, or awe. 2. Hard to handle or overcome; as a formidable job. Roget's College Thesaurus lists the following synonyms for formidable: appalling, tremendous, arduous, or Herculean. I would not choose any of these words to describe my role or the parents' role with the blind child. This is not the message I would choose to communicate with parents and other educators about what it will be like to raise or educate blind children. All parents are presented with challenges in raising children. The differences in raising blind children will necessitate at times different challenges. From my experience, probably the most "formidable" aspect of raising a blind child that parents will face is trying to get the professionals to provide the appropriate education and training that their child needs. And this is a problem with attitudes and bureaucracies—not the child and not the physical fact of blindness. Finally, here is a sentence from the book regarding the sighted guide technique: "The intent of using a human guide is not to relieve the child who is visually impaired of his travel responsibility, but to provide the child with the skill of taking an active role when traveling with a sighted person within both familiar and unfamiliar areas." My first response is, how can you observe your own movement off the arm of another person? This is a logical impossibility. Whose responsibility is it for the active movement of negotiating the environment? Why is it assumed that when a blind child is walking with a sighted person that he or she will be naturally guided? What is active about following another's lead? And why does the guide need to be sighted? There are times when sighted guide is appropriate, but to suggest that there's some skill in it that a child needs to learn for independence is ludicrous and false. The subtleties of the written word hit home hard when you are the subject matter. Blind persons and parents of blind persons hear the bias in these words clearly. First Steps is written by a professional, credentialed group of authors. The Blind Children's Center provides a real service for blind children, and in many respects this book is rich in useful information. But at its core are assumptions that communicate to those thirsty for knowledge erroneous beliefs about blindness. I believe these assumptions damage blind children. History has given us enough of these harmful, false images. We do not need them dressed up in the respectability of professional jargon, then pawned off to us as modern, scientific concepts. It is time we stress a promotion model, not a deficit model, of blindness. 1. What do we truly believe about the capabilities of blind travelers when professional organizations will not certify blind orientation and mobility specialists? 2. What are the vulnerable areas in blind children's opportunities to express their innate need to know and drive to move? 3. What is really essential to functioning with the cane? 4. How can the sighted guide, pre-cane techniques, or pre-cane devices be considered precursors or predictors of independent travel? Where is the research to substantiate these common assertions? 5. What do orientation and mobility specialists believe about the parent-child relationship? 6. How can the use of resonance and the broader perception of sound and space be facilitated in blind babies and older children? How do we enhance or distort its use in the type of canes we recommend and choose for them? 7. Has our sighted bias ignored the contribution to movement that the utilization of auditory object perception (echolocation) facilitates? 8. What subtle, or not so subtle, messages do we send to blind children that discourage them from moving actively in the world? 9. How do we interrupt or inhibit the self-initiating and sustaining movement of blind babies and children? 10. How do our touch and physical handling of blind babies and children affect the development of the use of their own touch? How do the touch and verbal cues that we impose upon children in a travel situation affect their abilities to figure out and solve their own travel problems? 11. What do we do to a blind child's interest in and ability with the cane when we try to teach adult skills for which children are developmentally not ready? When we delay giving them a cane in favor of a pre-cane device? 12. How are blind children's self-image and desire for independence affected when we teach them that someone else will take responsibility for their movement? When that "someone else" is always sighted? 2. It assumes that blindness need not be "fixed." 3. It promotes the concept that "differences are not deficits." 4. The alternative techniques of blindness promote a "can do" approach to life. 5. It deals with issues and concerns that are fundamentally human. What I have described to you today is what I call a pediatric perspective on independent mobility. I hope it fuels your beliefs and actions—as your child's first mobility teachers—in promoting your child's independent movement in the early years. In summary, the need to know and the drive to move are fundamental to being human. Therefore, orientation and independent mobility is more than a way of moving from one place to another, it is a way of life. It is a way of knowing, a process of reciprocal interaction, of being with the world instead of separate from it. This process during the early years of life enables the blind child to engage with the world in an increasingly independent manner. During these early years a common thread will sew together the variety of experiences. This thread is the fundamental fact that, like all children, blind children have an innate sense of order, an inherent ability to organize their experiences, and the ability to learn from (and improve upon) those experiences. From the earliest sensory motor schemes to the formation of intentional thought and complex problem solving, the drive to want more and to make more out of what reality at any given moment appears to offer is as much the foundation of purposeful thought and movement for blind babies and children as it is for those who are sighted. It is of particular importance that parents be provided with accurate information about blindness and this natural process so that they can better teach and assist their children to interact independently with and within the world. Together as a team—parents, child, and professionals—we engage in common goals that will facilitate the child's natural need to know and the drive to move. 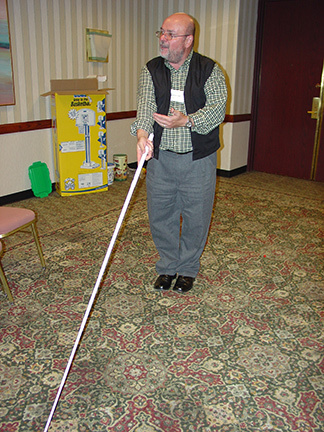 The history of formalized orientation and mobility has entrenched an adult-to-adult approach, with sighted guide and pre-cane techniques being taught prior to cane instruction. This tradition can be thought of as a top-down model. In this model adults first learn the concepts, then learn the motor schemes to match these concepts. With a pediatric perspective, however, the approach will be bottom-up. (I want to acknowledge the influence of Dr. Lorraine McCune on my thinking. Her knowledge and clear thinking about what babies do and how they learn contributed much to the development of this model.) First, children learn purposeful movement, then with a solid foundation of motor schemes upon which they have learned to trust and rely, they learn the concepts. Out of the experience come the concepts, the ways of thinking about the world. With this bottom-up model, parents and other educators will explore strategies, activities, and tools—such as the cane—that will facilitate purposeful thought and purposeful movement. This approach rejects the notion that children must have a certain maturity level before they can use a cane for movement. Maturity unfolds as movement and motor schemes become more sophisticated. The cane can assist in this process from the moment a child begins to walk. In this bottom-up model, cane travel will not be considered an isolated set of skills. Instead, the spoon becomes the precursor to the cane. Tools to manage space that are handheld and get a task done (spoons, scoops, shovels, etc.) will be respected in this bottom-up approach. Motor skills for cane usage, from this perspective, are not a mysterious set of unique skills requiring extraordinary knowledge and specialized training. They are extensions of ordinary motor schemes and tool usage that all children may learn and parents may teach. There is also no need for so-called pre-cane techniques and pre-cane devices in this approach. In truth, pre-cane techniques are actually alternative travel techniques (which are, incidentally, inferior to cane travel techniques), and not at all necessary in any way for cane usage. The same is true for pre-cane devices. They are actually alternatives to the cane, and in no way add to a child's preparedness for the cane. Also with this approach, parents and other educators will be cautious not to insist prematurely upon cane techniques that may be appropriate for the adult but not be at the appropriate developmental level of the blind child. Blind children need to explore, figure it out, and develop self-taught solutions that are respected by the adults in their lives. Pediatric orientation and mobility from the bottom-up perspective respects the developmental needs of all children: security, movement, the interpreting of sensory information, communication, and autonomy. These needs are met in the day-to-day living of the child; in feeding, bathing, playing, socializing, and exploring the world. The blind child's use of the cane is simply a natural part of growing up, as normal as learning to use a spoon. Above all I want to stress that our beliefs as parents and educators will affect what we give and how we give it, what we teach and how we teach it, and what our expectations will be for our blind children's development toward independence. These beliefs will not only affect our relationships with each other, but what our children will ultimately come to believe and expect of themselves as blind persons. I hope that these thoughts assist you in your role as your children's first mobility teachers.